Although krill are only about two inches in length, these creatures play a major role in the ocean food chain. Without krill, many ocean creatures would die and species would become extinct, including certain whales. Pet fish, crabs and lobsters are often fed krill, because these tiny fish are a major staple food in their diets in nature. You can purchase freeze-dried krill in numerous pet stores, but keeping live krill in an aquarium might be better for your pocket and, more importantly, for your pet. Buy a small fish tank and saltwater from your local pet store. 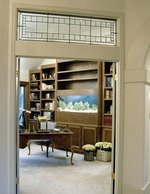 Purchase another fish tank if it is near summertime. This second fish tank will serve as the breeding ground for your krill. Set up the filter as well as the pump in the tank and fill it up with saltwater. Place the fish tank for the krill apart from other tanks that contain other types of fish, which should keep the krill safe from being eaten before breeding. Buy 10 to 30 krill, live plants and algae wafers at your local pet store. Don't overcrowd your fish tank with krill at first, because breeding may result in more krill than you can handle. The live plants, which will serve as habitat and food, should be scattered around the aquarium. Place algae wafers into the fish tank, and let the wafers sink. The krill will eat the live plants and the algae wafers as well. They will swim to the bottom of the tank to feed on the wafers. 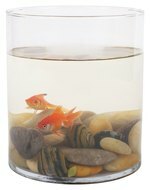 Replace the water in the aquarium regularly or when it starts to fog. Fill buckets with saltwater one day in advance. Disconnect any electric plugs connected to the aquarium to prevent damage to the filter and to avoid electrocution hazzards. Empty and replace 20 percent of the water at one time, and remove any solid waste. Wait until the summer time for the female krill to lay eggs. The breeding season for krill lasts for about five months. Female krill may spawn broods that contain 3,000 to 8,000 eggs. Multiple broods may be spawned in one season. Once krill hatch, they take about two to three years to reach maturity.